What is a Holographic Sight? How Does a Holographic Sight Work? If you are a hunter looking for gear and equipment, you might have heard about various sighting devices including red dot sights and holographic sight. Both of them have their own pros and cons that you need to evaluate based on your needs and requirements before choosing one. While red dot sight is cheaper, more compact and saves more battery, the best holographic sight can assist you aiming much more quickly and precisely. Thanks to its benefits, holographic sights are become more popular with a thousand of choices for your consideration. Too many choices might make you feel overwhelmed, especially when you don’t have much knowledge about this device. Therefore, if you are thinking about purchasing a holographic sight, here is the most basic and essential information about it. Actually, this is the only way for you to make the most informed choice. A holographic technology was introduced in the 70s with the first application in military field. It comes by many names such as “Holographic weapon sight” or “Holosight”. From then on, this technology is commercialized by Armson OEG, which later on becomes Trijicon, one of the most popular manufacturers of holographic devices. In any holographic sight, the reticle has a small dot circled by a ring to make it easier for hunter to aim at the target. The window from which the dots are displayed is in rectangular for a good field of view. When the users zoom in, the reticle will become bigger while the small dot remains the same size. Overall, a holographic sight uses laser light. First, it generates a red laser in form of a reticle. It will then present the dots on a special type of glass. The reticle will show up in the hunter’s field of view, which is actually imposed on the target. Therefore, what you see on this glass is the reconstructed view. Using holographic technology can help you to aim at the target quickly without closing any eye. Any hunter would know that being able to see with 2 eyes help you aim at more targets successively. In addition, he would have a better field of view. Another benefit of a holographic sight is that it is free from parallax at the distance of up to 100 yards. Furthermore, when you move your weapon around, the reticle will still remain on the target. There are several areas in which a holographic sight is different from a red dot sight. First of all, while a red dot sight uses a LED to produce the reticle; a holographic sight bounces the LED back to a glass to produce the reticle. Many people report that a holographic sign is more precisely and helps them to aim much more quickly. In addition, it is less prone to errors in parallax. In this case, your eyes will be perfectly aligned with the device. Nevertheless, a holographic sight is less compact, and it consumes a greater amount of energy and more vulnerable to the change of the outside temperature. It is also more complex and harder to use, thus, it is much more suitable for a trained hunter. The price of a holographic sight device varies among different brands and models. Knowing how much you can afford can help you to narrow down your selection a great deal. You can always choose a cheap holographic sight; however, the performance and durability of such product won’t be as great as the more expensive one. Hence, if you are serious about hunting and want to use a holographic sight for a long time, consider paying a premium price for a good product. In reality, a good product might cost you around 300 to 400 dollars. The performance of a holographic sight depends on the amount of light the device can have. You need a holographic sight with a high performance of a lot of light when hunting in the dark areas or at night. On the other hand, you might not need too much light in case you go hunting in the broad day light. Another factor that is related to the performance of a holographic sight is the speed of target acquisition. If you are aiming for a quick moving target, this is definitely an essential feature that you need to consider. Finally, when you go hunting for a long time, you should look for a holographic sight with less power consumption. Therefore, you can use this device as long as you want to. It is worth mentioning that you should choose a holographic device which use AA batteries. This is because these kinds of batteries are cheap and available in every shop. The choice for the design of a holographic sight depends on your preferences as well as requirements. A good holographic sight should be compact so that you can easily carry it around. In addition, it should be compatible with your current hunting weapon so you can use it effectively. Besides, the device should be easy to mount. There are several characteristics that could determine the durability of a holographic sight. First, there is a link between price and durability. The higher the price, the longer the device can last. However, you can still find a good holographic sight at a reasonable price. You can check for the specification of shock proof frame. A good one can hold up to .5 caliber recoils. Last but not least, you should aim for high quality material such as magnesium alloy. A good holographic sight would come with a variety of brightness settings. Therefore, you can easily adjust it to the condition you are hunting in, whether it is day or night. Trijicon: With this technology, hunters can aim for target at both close and far distance. This is due to the help of the Ruggedized Miniature Reflex mounted on the rear of the device. There are other technologies such as aluminous setting for ambient light condition, prism design or compact optical system. There are other features you need to consider such as the weather proof ability so that you can still aim clearly when it is raining. In case you want to go hunting at night, make sure you can purchase a holographic device with the night vision mode. At last, here is review of the 4 best holographic sights for your consideration. This holographic sight uses the EOTech and is one of the most popular sights on the market. 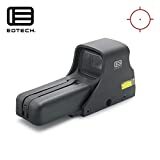 The EOTech holographic sight has metal components and a protective roll bar for the prism when the holographic sight falls down onto the ground. You can also use thermal imaging or night vision device with a holographic using EOTech. This sight uses AA batteries including both lithium and alkaline type. It features battery indicator and auto shutdown function. Additionally, the batteries can last for 1000 hours. This holographic sight has a great accuracy as well as control. It also offers speed and versatility with 12 brightness settings for you to adjust to the current condition of light for a better eye relief. There is a standard mounting platform in which you can mount multiple devices such as flashlights, optical sight and bipods. This holographic sight doesn’t feature a night vision mode, which might make it not a great option for any night hunter. With the weight of about 11 ounces, it is heavier than other sights on the market. This sight offers the view of 15.8 m at the distance of 100 m. There are 4 different reticles with green and red dots. It offers the shock proof, rain proof and frog proof ability, which is just like any other good holographic sight has. With the built in Quick detach mount, it is very easy for the users to remove or install this device. This device is also equipped with aluminum shield hood, making the construction more sturdy and stable. 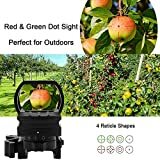 It offers great accuracy with unlimited eye relief. It has a limited range of brightness settings as it contains only 5 different levels of brightness settings. This device features weaver quick-detach mount along with the protective aluminum shield hood. It comes with the waterproof, shockproof and fog proof ability. Also, it offers the max recoil of up to .50 caliber, which is among the highest shock proof you can find. Additionally, 3 AG5 batteries are included in the pack. 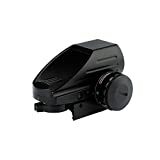 This holographic sight is ideal for hunting at a close range and aiming at fast moving targets. This holographic sight has a night vision mode, thus, it’s suitable for any hunter who often goes hunting at night. In addition, this sight offers infinite eye relief and 105 foot field of view. Therefore, it provides a great accuracy and better experience when you have to aim for a long time. The company offers lifetime warranty for this product. It is very easy and quick to mount the device thanks to its smart design and light weight. It has a short battery life in comparison with other new models from Sightmark as well as other holographic sights on the market. There is no built-in laser function. This device is made of high quality aircraft graded aluminum alloy. It features the shock proof, fog proof and water resistant ability. There are 4 separate reticle patterns. Also, it uses a CR 2032 battery. It is one of the lightest and most compact holographic sights so that you can carry it easily in your small bag. Moreover, this holographic device offers unlimited eye relief and a wide field of view. It features a long battery life which can last for more than 1000 hours on normal brightness setting. It is has a reasonable price but is not cheaply made either with high quality material and sturdy construction and nice finish. This holographic sight does not come with a night vision mode. Overall, a holographic sight is very convenient and useful if you want to spot moving objects in a wide field of view. It is definitely a must-have item if you want to enhance your hunting experience. With a wide range of options , it is a wise decision to invest your time, effort and money to find the best holographic sight. I hope all of the information above can help you with the process and make the most informed decision.